We no longer shy away from cabbage in the vege box, having a few tasty tricks up our sleeves, but they're bloody big vegetables and I'm glad to have acquired one trick more. This pasta bake comes from 101 Cookbooks and echoes the same cheesy-starchy approach that the author Heidi Swanson adopts in her white beans & cabbage recipe. While Swanson's photographs are always appealing, the featured shot of this casserole is additionally a little misleading - that's either a paella-for-twelve-sized skillet or a small fraction of the recipe described. By contrast you can see that my pasta bake was at risk of bursting out of my large baking dish. Parmesan and waxy potatoes do suit cabbage well, and here mustard and a second rind-y cheese add some extra piquancy. The baking (instead of the previous recipe's sauteing) adds a whole lot of extra effort too, what with the pasta, the potatoes and the cabbage all requiring pre-cooking. It was worth the effort; a patient, plodding hour in the kitchen and nearly another hour waiting yielded lots of leftovers that I gladly microwaved at work throughout the week. Michael bought a delicious fancy (and pricey) soft-rind cheese but it sadly got a bit lost in the mix. We might buy something a bit stronger - and dare I say it, cheaper - next time we're making a mustardy cabbage pasta bake. Clean and/or peel the potatoes, then place them in a medium-large saucepan and cover them with water and a pinch or two of salt. Bring the potatoes to the boil then simmer them until tender, about 40 minutes. Drain the potatoes and set them aside to cool. While the potatoes are cooking, fill a large pot with water and a pinch of salt for the pasta. Bring the water to the boil and cook the fettuccine until tender, about 8 minutes. Drain the pasta and set it aside. I used the drained pasta pot for the mustardy cabbage. Set the pot or a frypan over medium-high heat and melt the butter in it. Cook the leeks in the butter for a few minutes until they soften, add the garlic and stir it through for a minute. Stir in the cabbage and pour over the stock. Sprinkle over some salt and cover the pot for a few minutes to allow the cabbage to steam. Remove the lid, turn off the heat and stir in the mustard, 1/2 a cup of the parmesan and half of the sage leaves. Preheat the oven to 200°C. By now the potatoes should be cool enough to handle. Slice them into 5mm-thick rounds. Grease a large, high-walled baking dish. Spread half of the fettuccine across its base, then layer half of the cabbage mixture over that pasta. Next go half the potatoes, 1/2 cup of parmesan then dot over half the cheese cubes. Repeat the layers of fettuccine, cabbage, potatoes and cubed cheese to use up those ingredients, then finish up by sprinkling over the last of the parmesan and sage leaves. Bake the casserole until golden on top, about 50 minutes. Hi Johanna - there certainly is a resemblance! I might consider keeping the cheese to the top layer if I make this again. Thanks. An awesome bake! I love cabbages anyway and don't ever shy from them, but this must really give them some extra oomph. 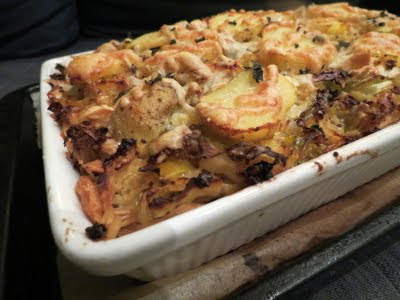 Love the idea of a mustardy cabbage bake, that is exactly my kind of food. Thanks, Kathryn! It's just right for the last signs of winter that we're still feeling down here in Melbourne.